One of our family traditions - in part due to the apple trees in my parents backyard involves a Sunday morning sometime in the fall though I can remember it being done in December on occasion - is making and canning applesauce. Because of this history I have a tendency to turn my nose up at store bought applesauce. And though my mom is probably right and it isn't cheaper to can applesauce I still adore it. I had never thought about till this year everyone has their jobs. Gabe and David(when he was home) and Dad too usually did the picking. 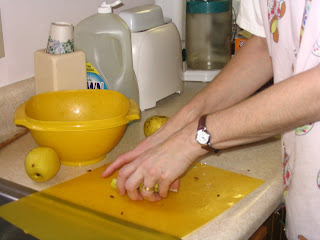 When it came to making the applesauce Mom and I tend to have the cutting and coring duty. 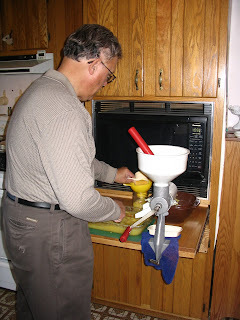 Dad and sometimes David and Gabe were in charge of the machine that truly makes the applesauce. Which I should mention I actually used this time and realized I never do this part. It is also great because it spits out any run away seeds and the peels. (Note this machine also makes great jelly). Dad sugars the applesauce and Mom and I test it. It is then put in jars and canned. I must admit that it is hard work. It is definitely worth it and much more fun when everyone helps. We made 32 quarts of applesauce in 3 hours. We still have more apples but maybe we will wait till December. what a fun family tradition. i hope next year anthony and aaron will be out there with grandpa and uncle gabe picking. i have enjoyed all the apples we took with us this last visit. 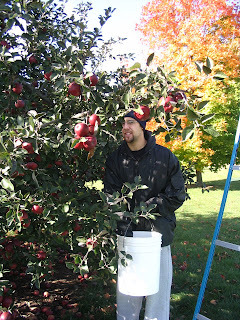 ( which have become apple dumplings, apple pies, apple crisps and thanks to your recipe- apple butter).